Resolution for intention to consider listing Yorbanie and others on State Heritage Register. and 26 Yeomans Rd North Richmond and 302 Grose Vale Rd, Grose Vale. The NRDCAA will prepare a submission based on the protection and retention of these significant properties. The NRDCAA is of the firm view that any conservation management plan (cmp) must protect the Heritage of this rare site which is held in high esteem by the NRDCAA, its members and the permaculture and sustainable agricultural community. The Heritage Council, the Developer and others have worked co-operately to reach the conclusions. This is acknowledge. Accordingly, the cmp should be prepared in consultation with the key stakeholders including the NRDCAA, University of Western Sydney, sustainable agricultural community and Hawkesbury Harvest. The cmp must ensure the Keyline system of soil improvement, erosion control, water storage, cultivation and irrigation on undulating topography which was first developed and demonstrated on the sites are protected. To do otherwise could lead to the destruction of the site, which Professor Stuart Hill said was the first organic farm in Australia. An inspiring and informative day about Redbank Creek’s habitat for native platypus, fish and birdlife. BOOKING IS ESSENTIAL before June 21. HEN is a not-for-profit, volunteer organisation. Various groups will be meeting as the Umbrella Group on 12 April, 2012 at 7.00pm at North Richmond Community Centre, William Street, North Richmond. NRDCAA AGM will be held on Monday 16th of April at 7.15pm at North Richmond Community Centre, William Street, North Richmond. The activities for 2011-2012 can be downloaded here. Community Action for Windsor Bridge (CAWB) is a community action group which was formed in response to the Roads and Maritime Services' (formerly Roads and Traffic Authority) decision to demolish and replace the existing Hawkesbury River bridge (Windsor Bridge) at Windsor and restructure adjacent intersections and approach roads. CAWB produced a paper and presented this to the Windsor Business Group on 27/2/12. It can be downloaded here. The Roads and Maritime Services conducted a preliminary investigation into the possible options which could achieve their objectives. They selected Option 1 as their preference and are now seeking approval from the Minister for Planning and Infrastructure for its construction. CAWB is made up of local people from a wide variety of backgrounds including lawyers, engineers, financial advisers, business owners, teachers, architects, builders and academics.CAWB is also made up of families who have passion for the Hawkesbury and their local community. Many also have ties to the very early settlers in the Hawkesbury and are proud and protective of both their longstanding family ties to the area and the historical significance of Windsor. CAWB's mission is to stop the approval and construction of any bridge (including adjacent intersections and approach roads) that diverts through traffic into the Windsor town centre and historic Thompson Square precinct. CAWB seeks ways to reinstate and restore the heritage value of Thompson Square and make it the enjoyable open civic space first envisioned by Governor Macquarie. CAWB understands that this will service the needs of the community, attract heritage tourism, increase local business turnover and hence ensure Windsor's future amenity and prosperity. For more information on CAWB visit their website. NRDCAA has submitted a response to The way forward for planning in NSW, the issues paper of the NSW Planning System Review, released 6 December 2011 which can be downloaded from here. Representatives from Community Groups, and residents from HLGA met on Monday evening 27 02 2012 to discuss Council Elections in September 2012. 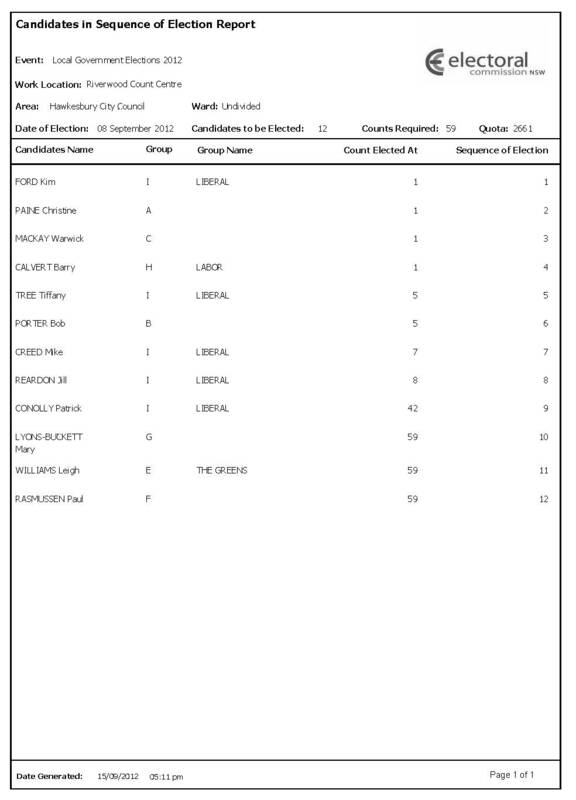 The Umbrella Group (UG) felt there was an urgent need to identify potential candidates for Hawkesbury Council elections in September 2012. The UG are of the very firm view that the majority political group of liberal Councillors are not representing the interest of residents and ratepayers. The evidence for that is demonstrated by the back flip by then Mayor Bassett which lead to the overturning of the Mayoral minute subsequent to his election to State Parliament. In addition, the same political grouping continue to approve development without adequate infrastructure leading to extensive traffic congestion and stress by residents and ratepayers in and around Richmond, North Richmond extending to Kurmond, particularly in the am, and feeder roads along the way. Further, the UG declared it was absolutely essential, if the community wants a fair go, the community must never again elect a political group with an absolute majority within Council. It has led to a diabolical situation where the current majority are not listening nor representing the interest of residents and ratepayers. The representatives will discuss the outcome with their communities; seek support to participate in further meetings to progress an outcome that will truly represent the interest of ratepayers and residents. Once feedback is received the UG will meet again. The aim is to reconvene Monday March 26 2012. Fellow Members and Supporters please be advised the North Richmond and Districts Community Action Association (NRDCAA) meeting due to be held on Monday 19th March 2012 has been cancelled as members of the Committee of Management of the NRDCAA have applied to attend the State Government’s Public Cabinet Meeting and speak to Ministers regarding the lack of infrastructure in the Hawkesbury and the effect on the population. HOWEVER , there is something that YOU can do!! Our local Member of Parliament, Mr Bart Bassett , who was elected to represent the people is refusing to communicate with YOUR association, effectively disenfranchising the members of the NRDCAA and the public who attend our meetings and have asked us to represent them and their concerns for the well-being of the Hawkesbury and it’s residents. He has used the excuse that we have misrepresented him, he has only detailed one instance which was an error of editing and was corrected as soon as it was noticed, within 2 days. We do not think that this is acceptable behaviour from someone who is supposed to represent us in State Parliament. According to the research that I have done he is under NO OBLIGATION to communicate with his electorate!!!!! This situation MUST BE REMEDIED. So, we need you and others to communicate your dissatisfaction with his refusal to communicate and do his job of representing his constituents to the Premier and other members of State Cabinet. Please take the time to write and support your association in the job that you have asked us to do on your behalf. The NRDCAA at all times strives for accuracy. Any error brought to our attention will be immediately corrected. NRDCAA welcomes donations from the community and businesses to help with costs associated with getting our messages out far and wide. 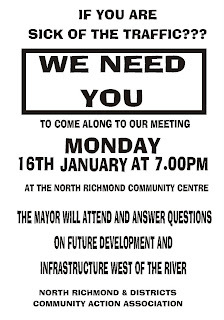 Account Name: North Richmond and Districts Community Action Association Inc.
1) Are you aware or would you enquire with appropriate persons if there could be suitable land available in the future for potential residential development at the UWS Richmond? 2) Community Engagement Policy: We note the “Objectives, Background and Principles” of this policy and we ask you to ensure that due to the concern that the community is expressing with regards to the continuing development and impending Planning Proposals without adequate infrastructure, that public meetings in appropriate locations be organized by HCC in consultation with community groups as part of community engagement prior to HCC considering any Planning Proposal that would affect the community? 3) The Member for Londonderry at a HCC meeting in his capacity as a HCC councillor said words to the effect ”If you think you are going to receive money for infrastructure out here you’re dreaming”. 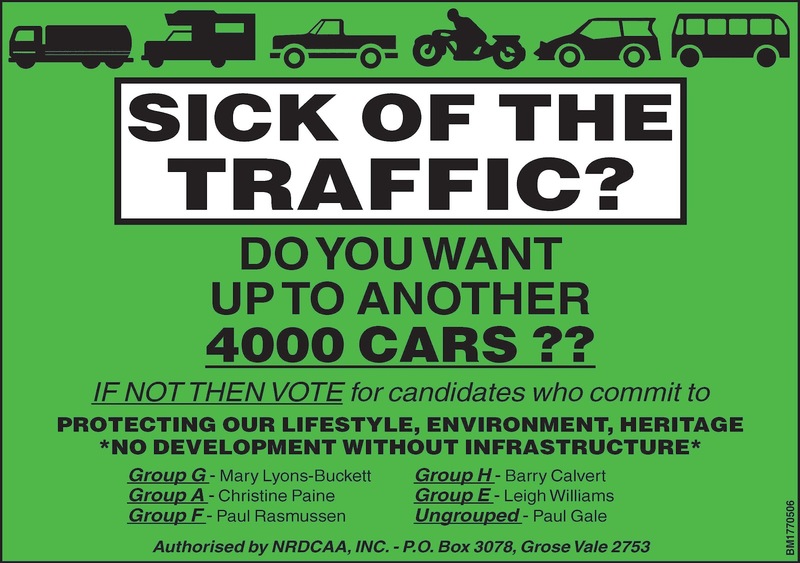 In view of those comments or similar would HCC erect signs on Kurrajong Road urging the State Government to upgrade the already grossly inadequate road system? The NRDCAA would consider “in kind” contributions. 4) Councillors are required to “represent the interests of the Community and provide leadership” Code of Conduct p2 first paragraph after the dot points. In view of that requirement to REPRESENT the Community will you now join with us in representing the Community’s interest to HCC, State Government ,Federal Government and Developers? 5) You have received an email from Mrs Margaret Mason with regards to Chapel Street and Kurrajong Road dated January 6, 2012. An answer has been provided by a HCC officer on 6th January 2012. The answer refers to the Roads and Maritime Services responsibility and indicates that they have been asked to supply the answer subsequent to their study of Kurrajong Road. 6) In view of this response will you correspond with the and request an update on the study that is currently being conducted (the CoM) thought that the study was complete, could you check please?) Will you ensure the update provides an approximate timetable for when the report will be available? In addition will you refer this issue to the council’s Traffic Committee for follow-up of timetabling, finance and any work that will be undertaken? Will you also ensure the Community Groups and the Community is kept up to date? 7) Hawkesbury Residential Land Strategy (HRLS): Will you provide the meeting with the sections ,page numbers and paragraph numbers HCC officers will consider when considering the rezoning of land west of the river? 8) As you are aware petitioners are continuing to petition you and Ministers Gay and Hazzard not to “Rezone land west of the river”. We understand that HCC officers are reviewing planning proposals on an ongoing basis. The community is overwhelmingly opposed to the rezoning of land west of the river, would you ensure that the NRDCAA and other Community Groups are kept in the loop simultaneously with regards to these reviews by HCC officers and when a Planning Proposal is lodged it is brought to the groups’ and the community’s attention immediately or as soon as practicable? 10) In light of the possible large development at 108 Grose Vale Road and the huge increase in “run-off” what has HCC done to rectify the inadequate and possibly dangerous drainage system as reported by HCC officer Alan Hastie on 18th July 2001 and again on 24th January 2003? 11) Are you proud of HCC planning of the current North Richmond Centre? 12) Does HCC have any “long term vision for the transformation of North Richmond centre” to something of which we can be proud especially in light of the proposed huge increase in population and traffic density? 13) Will you instruct HCC staff to prepare such a plan? 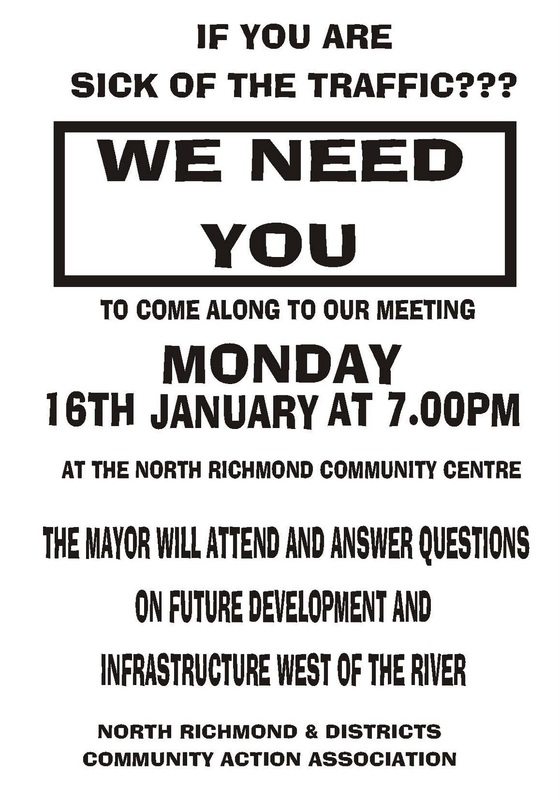 At the next Hawkesbury City Council Meeting, Tuesday 31/1/12 at 6.30pm, at Hawkesbury City Council Chambers, the North Richmond Joint Venture (development in North Richmond) is being discussed. The business papers for the meeting can be downloaded from Hawkesbury City Council’s website, http://www.hawkesbury.nsw.gov.au/council/council-meetings/business-papers/2012/january/31-january-ordinary, attachment 3 to item 4. The meeting is open to all so come along and hear the discussion from our Councillors. If we are to influence Councillors we need lots of people present at the Council Meeting on Tuesday evening. Bart Bassett does another back flip! At the last community meeting where Kim Ford, Mayor of Hawkesbury City Council addressed the meeting Bart Bassett arranged with the Chairperson, after the meeting, to attend the next meeting on Monday 20/2/12. Bart has sent NRDCAA and advised he will no longer be communicating with NRDCAA. NRDCAA has written to Bart Bassett and offered him the opportunity to address the 19th March, 2012 community meeting with an independent Chairperson, Kevin Rozzoli, at 7.15pm at North Richmond Community Centre. Will Bart accept this offer and meet with his stakeholders, the community? The letter that was sent to Bart Bassett can be read here.